Go to your local area of interest. Use the map controls to navigate. The Search textbox allows you to find and go to places in the US. Click on the Find Filtered Cores button to discover filtered GI Cores items. NOTE: this button will be disabled when zoomed out too far; please zoom in to enable. To create these filtered GI Cores items, please use the GI Cores Filter web application. Each of the filtered GI Cores items will be enabled if the number of filtered cores in the current view is less than the maximum allowed, which currently is 1,500 cores. Click on an item to create a new hosted service based on the selected filter and the current map extent. The score for each core is calculated based on the user specified weights for each parameter. Change the weight for a parameter by updating the slider value. NOTE: all weights are relative to each other. GI Center Defaults: These are the default weights as defined by the Green Infrastructure Center. Biodiversity Defaults: Similar to the GI Center defaults except with a slight bias towards biodiversity. As you change relative weights, the chart will update with the relative weights. Click the Update button to calculate the new score for each core and to update the hosted service. Click the Save As button to save the current weights as a new hosted service. "A core is an area or patch of relatively intact habitat that is sufficiently large to support more than one individual of a species" (Firehock and Walker, 1015). For our purposes that's an area at least 100 acres in size and at least 200 meters wide. 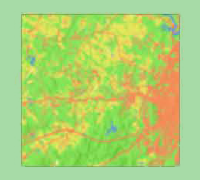 We assembled and used nationally available databases and implemented a methodology using ArcGIS toolboxes and configuration files, published by the Green Infrastructure Center, Inc.
For the initial definition of cores, the most important dataset was the National Landcover Database 2011. 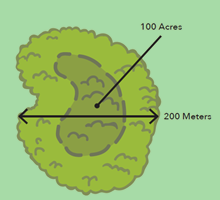 Using it we considered intact habitat to be any landcover class that was not "a developed area" or agriculture. Agriculture is an important element of Green Infrastructure planning, be we don't consider it existing natural habitat.